Peter Rabbit Magazine is the first and only magazine to bring the tales of Beatrix Potter to life. Based on the popular childrens book characters, creatively re-imagined and aims to encourage children to explore and play outside, while nurturing an interest in nature and wildlife. Each issue will feature popular preschool favourites like colouring, puzzles and stickers. Pages will support the Early Years Curriculum. My 2 year old daughter loves watching Peter Rabbit on Cbeebies - and this magazine is a lovely accompaniment. Lots of lovely stickers each month, pencil skills, colouring, a story, information about animals in the forest etc. 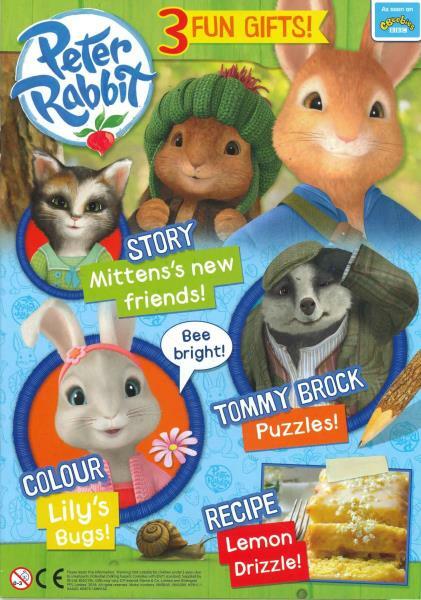 We have downloaded the Peter Rabbit club collectors card, and each month the skills badge that accompanies the magazine (alongside a small toy) gets added ! Its our favourite preschooler magazine. My 2 year old niece loves watching the Peter Rabbit cartoon and loves the magazine too. She enjoys playing with the little plastic toys that come with the magazine and she loves all the stickers. Her 5 year old sister enjoys the games, puzzles, drawing & colouring. The magazine is both fun and educational.